Much akin to bank fishing on a freshwater lake. The Puget Sound beach fishing, as we call it, ranges from bonefish like sand flats to cobblestone beaches. Offering demanding conditions, the saltwater often pays to those who practice their casting. Our team of guides prepares you for the day with talk about the ecosystem you are about to explore. Arch Anglers will also combine instruction on techniques and tips to entice more fish. Along with casting tips like how to cast with wind at all angles, we are by your side teaching you the fundamentals and technical nature of fly fishing. Saltwater brings forth a memory for all of us. Usually it involves an environment that teems with life in many forms. Most occurrences take place without our knowledge whatsoever. The life cycles are definitely turning here. Year round you can fishing for feeding trout in the saltwater. Of course the occasional feeding seal, wind knot and poor tide can complicate the fishing conditions. But that is why they call it fishing! Remember that most prey are oblivious to there predator. 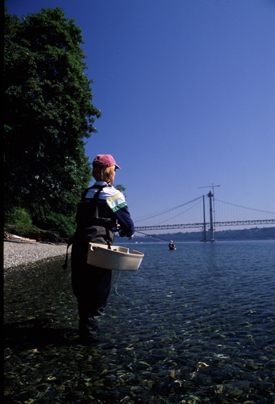 Shrimp, aquatic insects and fish rely on safety in numbers alone and do not swim away. They are easy prey. You can have confidence, hooking fish, when it is seemingly void of life, much like a lake. Fish will always take the easy meal first. The moral of this story is to relax, wade softly, strip slowly and…wait for the pull. Most Popular! $485 FULL DAY wade Trip - best value, includes lunch. 8-10 hours. $375 1/2 DAY Wade trip - fish the best tide of day. 4-6 hours. TRIPS INCLUDE: sales tax, snacks, water, and gear rental. Grilled lunch on ALL DAY and FULL DAY trips. Licenses not included. The local Puget Sound Rivers and beyond offer coastal cutthroat, westslope cutthroat and rainbows, from early spring through through November. 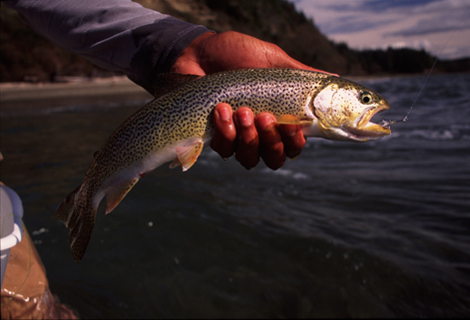 Sea-run cutthroat fishing in the rivers is prime throughout September and October. 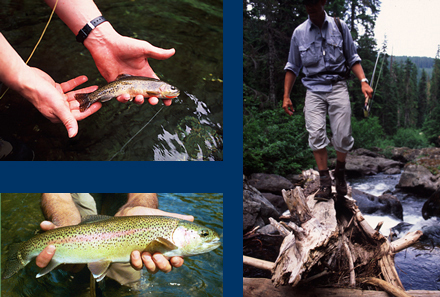 Before the spring runoff and after are the best times for trout fishing locally. Yakima River Fly Fishing is a Feb-Nov adventure, with some wonderful hatches throughout the spring and fall. The Cle Elum to Ellensburg stretch, is where we focus our efforts on the Yakima River. Single handed trout rods in 3-6 weight range are used for the sea-run cutthroat, and 0-3 weights are used for the resident trout in the small mountain streams. This is a great trip for those that are learning the basics, and/or those who want to get away from the hustle of the city and just relax on a beautiful stream. CONDITIONS: Walk-in or boat access to gravel bars. Easy to difficult wading. WADERS & BOOTS: waders with felt soled, and or studded wading boots. $485 FULL DAY Yakima River Float - Blue-ribbon trout fishing 90 min from Seattle. Overnight options. $375 1/2 DAY Yakima Float - work early or sleep in, then come fish for trout on the Yakima with us. 4-6 hour trip. $310 1/2 DAY Wade Trip - learn to cast, best for introduction to fly fishing. 4-6 hour trip. $400 FULL DAY Wade Trip - fish the Cedar or Snoqualmie for a day. 8 hour trip. ALL TRIPS INCLUDE: state sales tax, water, and gear rental. Grilled lunch provided FULL DAY trips. Licenses not included. Inquire about our BAREBONE TROUT FLOAT, where you bring your own lunch and we run our own trailer shuttle. The most sought after freshwater gamefish in North America is undeniably the steelhead. They span from California to Alaska and the roots of fishing for them are securely planted here in the state of Washington. The Skykomish, Sauk and Skagit still boast one of the best chances at an oversized steelhead, ranging from ten to twenty plus pounds. These large rivers drain the west slope of the the cascade mountains and have seen turbulent times, but these fish are resiliant. From excessive logging, development and over fishing the steelhead continue to return. Catch-and-release is practiced on guided trips, and conservation is key in the future of these fish. The steelhead is revered for its strength and aggressive nature when hooked. When they return after spending two to three years in the saltwater, they start there journey back up their natal stream. Spey casting instruction is included in all steelhead trips. Double-handed casting is the most effective means of covering our large rivers. Individual and group casting clinics are available at most fly shops and also through Arch Anglers. [go to casting page]. Becoming more proficient at casting the long rods will increase your chances when on the water. The philosophy of swinging flies for these anadromous (sea-run) fish will be explained and instructed throughout the day. RODS: 7-9 weight rods. We teach single and double-handed casting. $310 1/2 DAY Wade Trip - fish the morning low light, or evening. 4-6 hour trip. $400 FULL DAY Wade Trip - fish all morning, or fish the afternoon. 8-10 hour trip. $485 FULL DAY Float Trip - spend the day searching for steelhead. 8-10 hour trip. Inquire about our BAREBONE STEELHEAD FLOAT, where you bring your own lunch and we run our own trailer shuttle.